I met Sue Boehme last summer. She reached out to me, introducing herself as a local artist who works in many mediums. I agreed to visit her studio and was immediately intrigued by this artist. 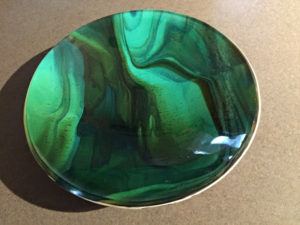 She has been walking the creative path for a long time and has created art using many mediums such as clay, metal, and glass. Sue answers our “Ten Questions to the Artist” so that we can get to know her, just a little. 1 & 2. WHAT TURNS YOU ON CREATIVELY, SPIRITUALLY, OR EMOTIONALLY? And do you have an influence or theme that guides your work? The recurrent theme in much of my work references the natural world around us- from the cosmos to cellular structures. I spend a lot of time outdoors, and find it a source of endless inspiration. As a child, I adored science and studied everything from fossils and minerals to butterflies and birds. 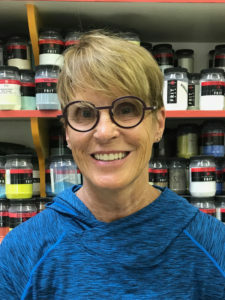 I have been fortunate to have experienced a number of careers in my life – I was a computer programmer in the eighties, a co-owner in a family millwright services business (I handle the accounting) for the past thirty years, an adjunct art professor for eight years, and now a private art instructor. If I could pick a profession, I would work for Warner Brothers to help design props for films, or Universal Orlando to design and sculpt the items that help provide an immersive experience for guests. Another great option would be an illustrator for a graphic novel, or an animator for Dreamworks. 4. WHAT PROFESSION WOULD YOU NOT LIKE TO DO? I wouldn’t care for any profession that includes handling sewage of any type. 5. WHO ARE YOUR FAVORITE ARTISTS? My favorite artists: Henry Moores’s drawings, Kathe Kollwitz, Lee Bontecoe’s early work, Japanese printmakers, Shaun Tan, Kazu Kibuishi, and Hayao Miyazaki. 6. WHAT IS YOUR FAVORITE TOOL USED TO CREATE YOUR WORK? My favorite tool are my fingers – I am a very hands on artist. 8. WHAT IS YOUR LEAST FAVORITE WORD? 9. WHO IS YOUR FAVORITE MUSICIAN? 10. HOW MUCH FORMAL EDUCATION HAVE YOU RECEIVED? Formal education includes a BFA in Sculpture from Kendall College of Art and Design, and approximately twenty intensive glass workshops. Thank you, Sue, for answering our questions. Stop in to the gallery to see her artwork. She and I will be hosting an Artist Talk beginning at 7:30 pm. Denise will be in the gallery, Friday night, November 3, 7-8:30pm.